What’s in a name: Irene, Greek goddess of…you’re kidding! Well, here’s an irony for you. Irene, the hurricane which is currently pounding the east coast with wind, rain, storm surge, tornadoes, etc is named after the Greek goddess of peace, Εἰρήνη (Eirene, pronounced eye-RAY-nay). The Romans called her by the more familiar name of Pax. 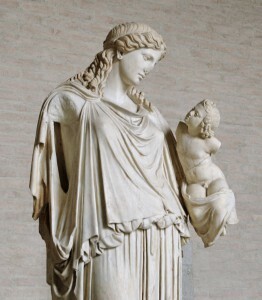 At right, a peaceful portrait of the goddess, a Roman copy of a Greek bronze. Hurricane names are chosen from a list each year, with the list rotating every few years. Names of hurricanes that caused significant damage are retired. In recent years, the National Weather Service has tried to alternate male and female names so that it’s not just women getting blamed for all the damage. So Floyd, Charlie, Andrew, and the harmless-sounding “Bob” have joined Camille, Opal, and Katrina. Here’s the current list of hurricane names for all parts of the world.